Turbocharging engines is nothing new. In 1909, a native of Switzerland by the name of Herr Bchi came up with the idea of using the exhaust gas from his diesel engine to drive a turbine to compress air and "supercharge" the intake side of his old knocker. As a result of Bchi playing with turbines instead of making cuckoo clocks, turbocharging has become almost commonplace in the world of big diesel-engined commercial vehicles and normal practice at the performance end of the market, but it has yet to make any sort of real mark in the world of production motorcycles. Over-the-counter turbochargers have been available for big four-cylinder bikes for years, but these bolt-on performance kits are only as good as the amount of work needed to make them work properly and harmoniously with the engine. 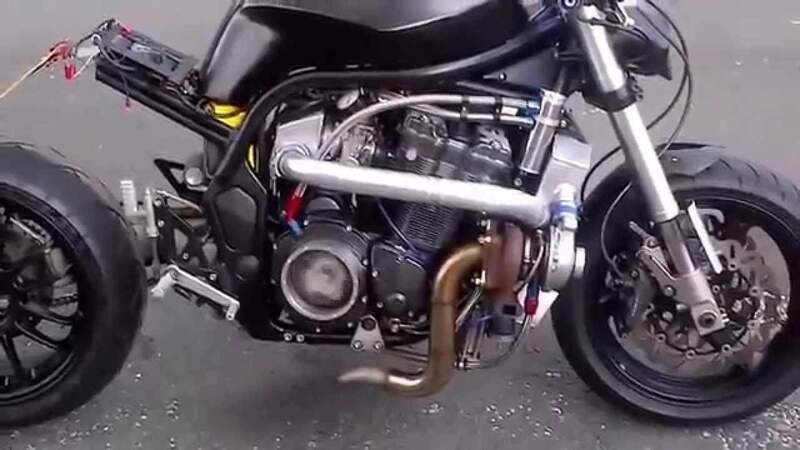 Honda, Yamaha, Kawasaki and Suzuki built turbocharged motorcycles in a mad fit of 1980s one-upmanship, and the corporate war between the giants spawned a trio of technically over-complicated and bizarre bikes...and the world's first successfully turbocharged production bike. 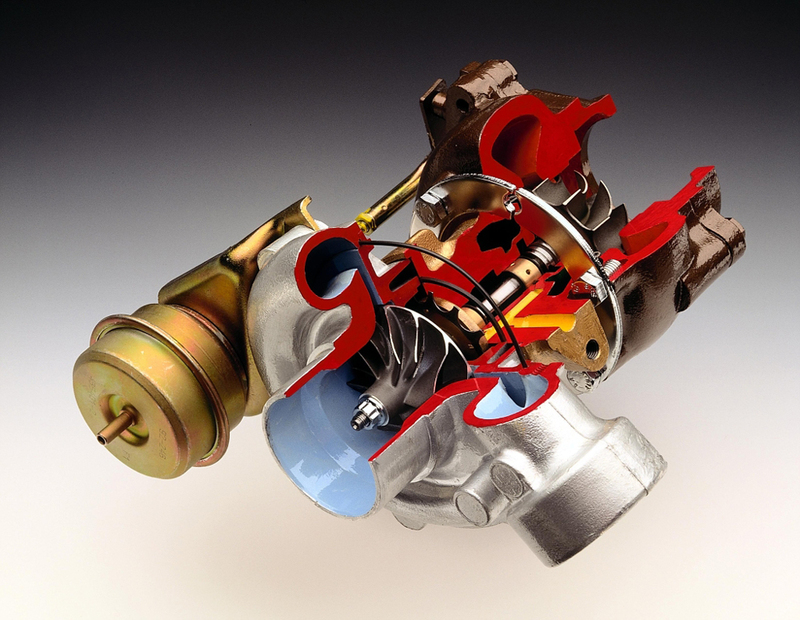 The turbocharger is a a small compressor, like as in a jet engine, that's installed in the exhaust flow of the vehicle. The exhaust gasses spin the turbine which is directly connected via a shaft to an impeller. The impeller is ducted to the intake side if the vehicle where it forces pressurized air, known as boost, into the manifold. More fuel is also introduced via carb or fuel injectors thus providing more horsepower. There are a couple of down sides to running a turbo. First, is, usually the engine must be built heavier in the bottom to take the increased pressures of the boost. Accordingly, the engine may be slower to accelerate a low rpm then a normally aspirated engine. Second, there is something known as turbo lag. Turbo lag is what occurs when you run the engine RPM up and you're waiting for the exhaust flow to spin up the turbocharger enough to increase boost. A good example of this comes to mind for me. About 20 years ago, when I was a new jet engine mechanic stationed at Dover AFB in Delaware, I bought a 82 Yamaha Seca 650. A friend and co-worker of mine had the 82 Yamaha Seca 650 Turbo. The 2 bikes could not have looked more different. Both had the same engine and driveline except his had the turbocharger and a full fairing from the factory. When we left from say a stop light, and both of us got on the gas really hard, I could out run him in first and second gear, but from there on, there was no catching him. My bike had a nice fat power band from about 2500-5000 RPM, while his powerband was only from about 3500-4500 RPM. I rode his bike on more than one occasion and when the boost came on, it was like engaging a warp speed switch for a few seconds. Turbochargers are a type of forced induction system. They compress the air flowing into the engine. The advantage of compressing the air is that it lets the engine squeeze more air into a cylinder, and more air means that more fuel can be added. Therefore, you get more power from each explosion in each cylinder. A turbocharged engine produces more power overall than the same engine without the charging. This can significantly improve the power-to-weight ratio for the engine. ­In order to achieve this boost, the turbocharger uses the exhaust flow from the engine to spin a turbine, which in turn spins an air pump. The turbine in the turbocharger spins at speeds of up to 150,000 rotations per minute (rpm) -- that's about 30 times faster than most car engines can go. And since it is hooked up to the exhaust, the temperatures in the turbine are also very high. On the other end of the shaft that the turbine is attached to, the compressor pumps air into the cylinders. The compressor is a type of centrifugal pump -- it draws air in at the center of its blades and flings it outward as it spins. Diversion of exhaust gases regulates the turbine speed, which in turn regulates the rotating speed of the compressor. The primary function of the wastegate is to regulate the maximum boost pressure in turbocharger systems, to protect the engine and the turbocharger. One advantage of installing a remote mount wastegate to a free-float (or non-WG) turbo includes allowance for a smaller A/R turbine housing, resulting in less lag time before the turbo begins to spool and create boost. Turbocharger lag ("turbo lag") is the time required to change power output in response to a throttle change, noticed as a hesitation or slowed throttle response when accelerating as compared to a naturally aspirated engine. This is due to the time needed for the exhaust system and turbocharger to generate the required boost. Inertia, friction, and compressor load are the primary contributors to turbocharger lag. Superchargers do not suffer this problem, because the turbine is eliminated due to the compressor being directly powered by the engine. Electrical boosting ("E-boosting") is a new technology under development. It uses an electric motor to bring the turbocharger up to operating speed quicker than possible using available exhaust gases. An alternative to e-boosting is to completely separate the turbine and compressor into a turbine-generator and electric-compressor as in the hybrid turbocharger.